The Free-Procurement Project is about much more than just free Purchase Order software. Your entire purchasing process can be free of paperwork. Free of budget overruns. Free of maverick spending. Free of frustration and unwelcome surprises. With SpendMap, you can automate manual purchasing processes, eliminate paperwork, reduce errors and save time. 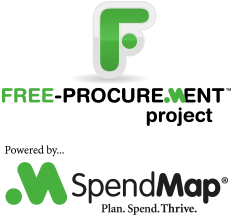 SpendMap empowers you to control your corporate spending. You can improve budget compliance, eliminate unwanted spending and improve your bottom line. SpendMap enables strategic purchasing initiatives by improving your visibility into your spending. You can reduce maverick purchasing, direct your staff to the right items from the right suppliers, and lower the prices that you’re paying for the goods and services that you need to keep your business running. For more information about how this free software can help, you can visit our corporate website.